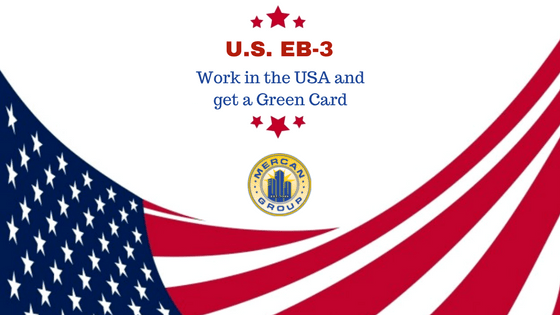 U.S. EB-3: work in the USA and get a 10 years Green Card | Mercan Canada Employment Philippines. Inc.
Work in the USA was never that easy! The U.S. EB-3 is an immigration program meant for unskilled workers to obtain a U.S. Green Card valid for 10 years. Under the EB-3 program, applicants can get the Green Card super fast and before going to the USA. This program has no age, language proof, education, work experience related to the job applied or net worth prerequisites. Also, spouses and unmarried children under the age of 21 can be included in the EB-3 application and get the Green Card benefits too. The EB-3 program has very few requirements. Such as, candidates must have a permanent valid job offer. Also, they must able to perform an unskilled labor (required less than 2 years training or experience). And the job position can not be temporary or seasonal. Finally, candidates should acquire a Labor Certification from the Department of Labor (Form ETA-9089). The processing time can vary according to nationality. Overall, you can expect your EB3 processing time to be about a year and a half to two years. For applicants from India, China, and Philippines, the processing time may be longer. After getting the US Green Card, there is no immediate requirement to stay in the US for the first two to four years. But to keep the benefits of the card, Green Card holders must travel to the US once every six months for a minimum of two weeks and have a permanent address in the US (rented apartment or owned property). Don’t miss the opportunity to apply for the U.S. EB-3 program, get your Green Card and live your American Dream. The job orders are labour certified and there are hundreds of positions available for Health Aides, Cleaners and Deliverymen. And Mercan Group has the experience and expertise to guide you through your application process. Count on Mercan to help you to make this dream come true. So, if you are interested on this opportunity, email your CV to manpower@mercanph.com.